Daniela and Korina Guzman, 19, completed their subject requirements for graduation in a year are shown at the library at Sharyland Pioneer High school Wednesday, May 09, 2018. 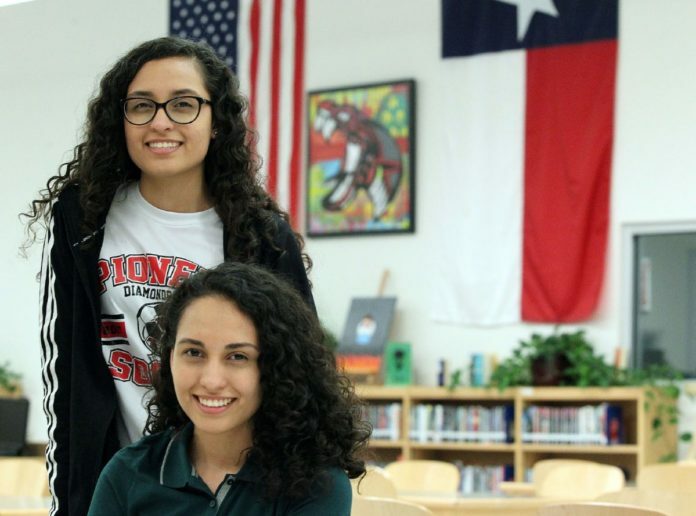 When fraternal twins Daniela and Korina Guzman moved to the United States and enrolled in Sharyland Pioneer High School for the spring semester, the two learned they couldn’t graduate until 2020 — by this time, they’ll have turned 21. While registering for classes, the Guzmans were notified the credits received from their school in Mexico were not valid. This is typical for many international transfer students. Unwilling to accept their fate, the pair made daily visits to their school counselor inquiring about other options. In an unprecedented move in Sharyland school district history, the 19-year-old students from Monterrey, Mexico, completed their credit requirements to graduate in one year. “Now, we’re just waiting for graduation,” Daniela said. After repeat visits to the school’s administration exploring all available options, a solution was reached. The twins each took 15 credits by exam in the subjects of history, chemistry, math and other grade level requirements. Study guides were crafted and tutoring attended. Every test was taken and passed over two weeks, beginning in March. The twins said their counselor, librarian, teachers, mother and stepfather expressed support and encouragement for their success. Despite their closeness and similar genetic composition, they consider themselves “totally different.” Whereas she considers herself relaxed, Daniela said her sister, Korina, is more serious. In the fall, Korina will attend the University of Texas Rio Grande Valley to study early education. Gabriela will attend South Texas College, and said she’s not yet sure what she wants to study. The aspects of Texas public school they enjoyed were the smaller class sizes, transportation, lack of uniforms and extracurricular opportunities. They participate in LEO club, Spanish club, Book club and swimming. “Don’t be afraid to start all over again,” Korina said.